The fifth largest state in the USA, New Mexico is an extremely diverse state, both in terms of culture and geography. Its landscape ranges from dry desert to snowy mountain peaks and everything in between, making it quite a stunning destination. New Mexico is home to the Sangre de Cristo Mountains, the Aztec Ruins National Monument, the White Sands National Monument and the Gila National Forest. As well, the Rio Grande runs through the centre of the state, with many lakes sitting along it. There are also others lakes throughout the state that make for great places to visit. 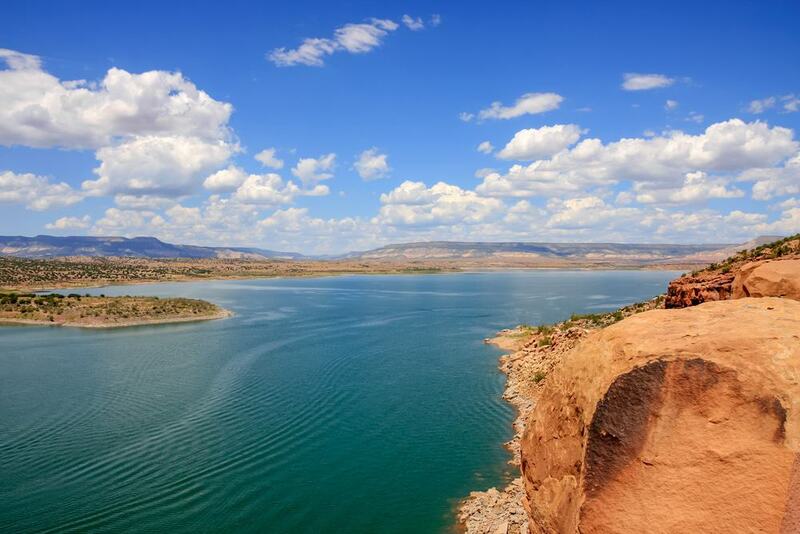 Here are the 15 best lakes in New Mexico. This picturesque lake sits in the northern part of the state and boasts a phenomenal backdrop of the Brazos Cliffs. Heron Lake itself is at an elevation of 2,190 metres within the Rio Chama Gorge. Other than its beauty, the main feature of the 2,400 hectare lake is the Heron Lake State Park, which is located on the lake’s southern shore. The park offers 200 camping sites, picnic areas and boat ramps. Many anglers come to Heron Lake to catch trout and salmon. It is also popular amongst sailors, windsurfers and paddle boaters. Navajo Lake was created by the damming of the San Juan River. The 6,300 hectare reservoir was named after the Navajo people. The southern shorelines of the lake are home to the Navajo Lake State Park. The state park has 200 camping and picnic sites, two marinas and two boat ramps. 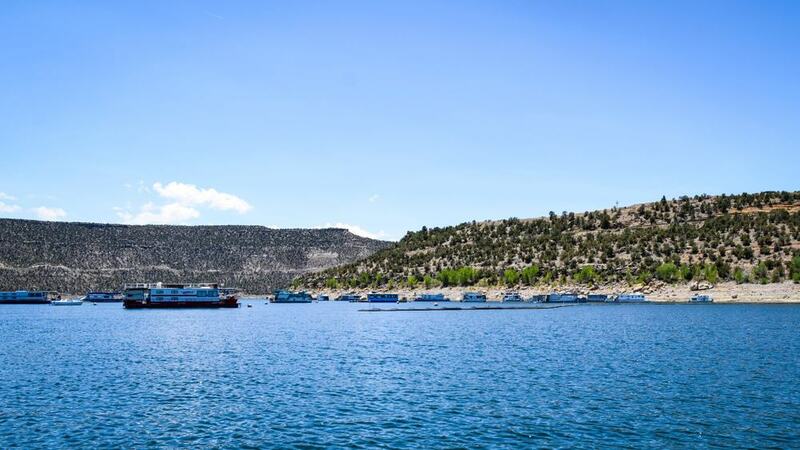 Boating is one of the most popular things to so at Navajo Lake, as is fishing. In fact, it is one of the best spots in New Mexico to fish for smallmouth bass, northern pike and black crappie. Recreation is the main reason to visit Caballo Lake, although the Caballo Mountains along the east side of the lake also make it quite beautiful. Tourists wanting to go swimming, water skiing, windsurfing or boating often come here. The 4,500 hectare lake is also a popular spot for birdwatchers thanks to the migratory birds that make a stop here on their travels. It is also a great lake for walleye, bass, crappie and bluegill fishing. Caballo Lake sits along the Rio Grande in the south part of the state. The Caballo Lake State Park is on the southwest corner of the lake, offering camping to those that wish to stay the night. Conchas Lake sits next to the Conchas Lake State Park along the Canadian River. The 3,900 hectare lake is known for its secluded canyons and coves, as well as its quiet beaches. The shoreline of the lake is a great place for hiking and bird watching. The lake itself is known for its fantastic fishing, although it also offers boating and swimming. 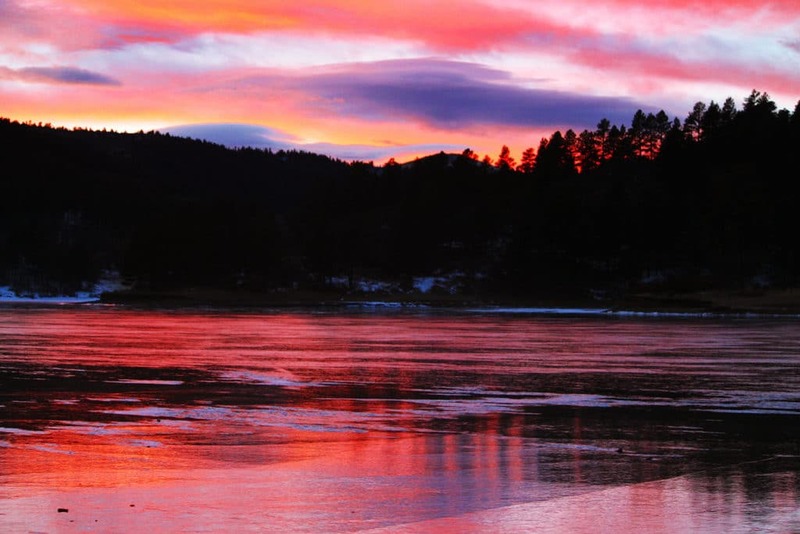 Those that wish to stay the night to enjoy the sunsets will find numerous campsites at the Conchas Lake State Park. There are also spots around the lake to go boat camping. If you want to spend time at the beach, Elephant Butte Reservoir is the best place in the state to do this. It also happens to be New Mexico’s largest man-made lake! 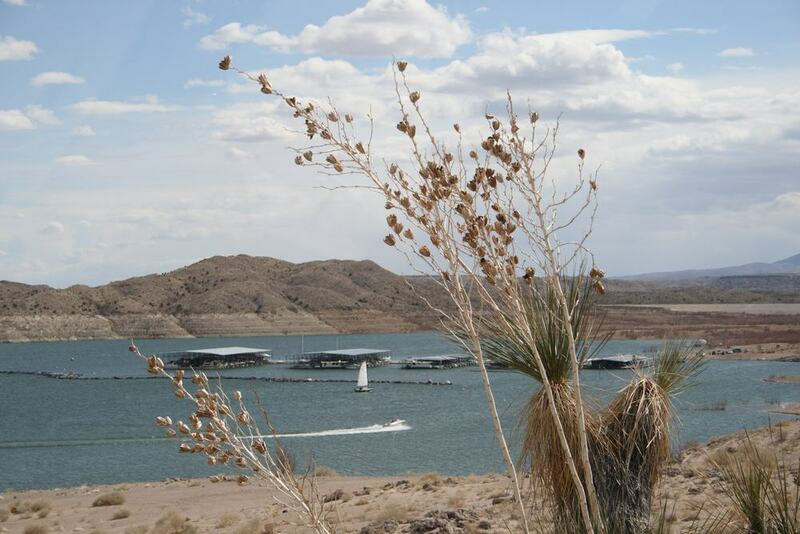 The 14,800 hectare lake is part of the magnificent Elephant Butte Lake State Park. This beautiful park offers camping and picnicking, and has a marina. The lake was named after a volcanic core whose shape resembles an elephant. This in now an island that sits within the lake. This 1,300 hectare lake sits along the Rio Chama in northern New Mexico. The reservoir is quite spectacular thanks to its surrounding mountains. There is a scenic 8.9 kilometres hiking trail that runs along the north edge of El Vado Lake, linking it to the Heron Lake State Park. 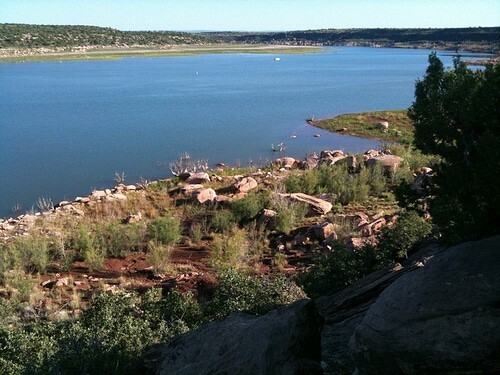 On the eastern side of the lake is the El Vado Lake State Park that boasts camping and picnicking sites. The lake has long been a popular spot for salmon and trout fishing. In the winter, visitors come here to go cross-county skiing and snowshoeing. Fenton Lake sits in the Yemez Mountains at an elevation of 2,331 metres. The surroundings of the lake make it one of the state’s most picturesque lakes. 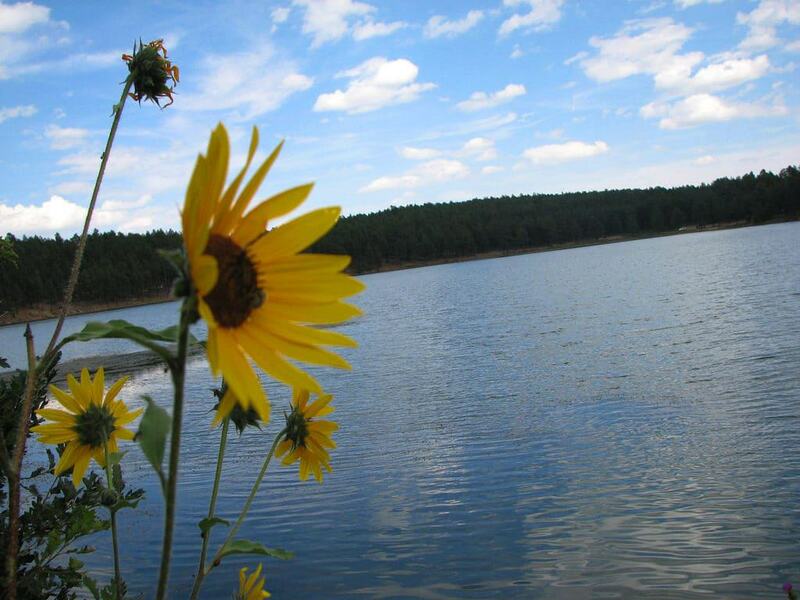 The lake is completely surrounded by the Fenton Lake State Park, which offers hiking and camping. It is also a popular fishing destination. Fenton Lake is open year-round, with ice fishing and cross-country skiing being available in the winter months. Visit in the summer and the kids can play in the onsite playground. 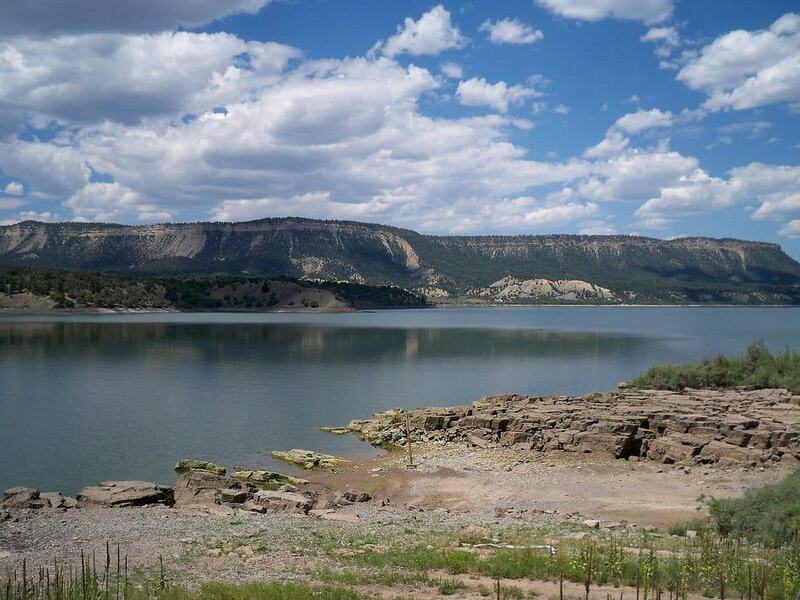 Abiquiu Lake was created by the construction of the Abiquiu Dam that sits along the Rio Chama. The 2,100 hectare lake is a popular recreation destination. Swimming, boating, fishing and hiking are all popular activities enjoyed at the lake. In addition to that, its 1,950 metre high elevation offers some spectacular views. The Riana Campground sits along the lake’s shoreline, having 52 campsites for tourists to enjoy. There is also a playground onsite. Formerly known as Blue Lake, this bell-shaped pool is renowned for its clear blue water. The pool is stunning, sitting in the middle of the desert like an oasis. 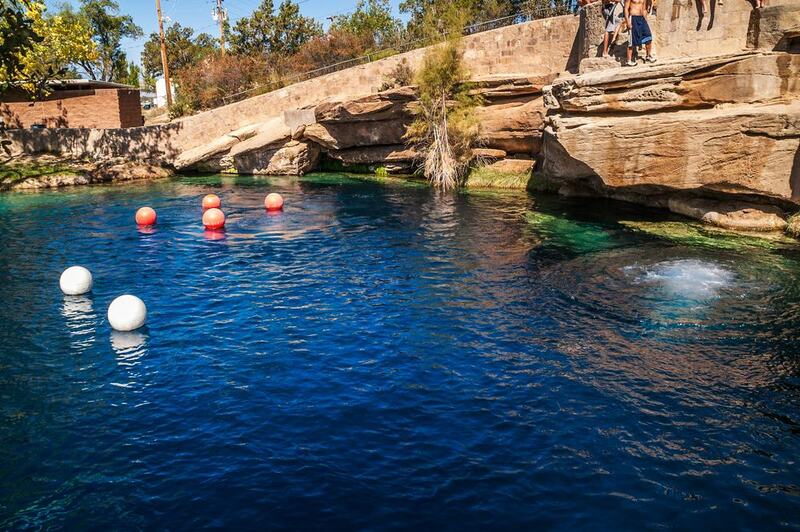 Blue Hole is one of the most popular dive sites in the entire country! Although it is small in terms of diameter, it is 40 metres deep. This is a great spot for families to go swimming on a hot day. Still, the water stays pretty consistent at 17°C, making it possible to dive into the water at any time of the year. 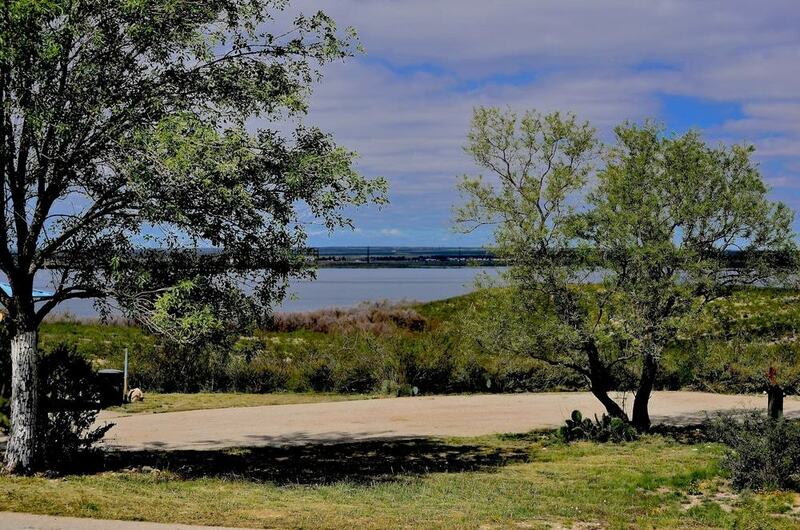 This 1,600 hectare reservoir sits along the Pecos River just north of the city of Carlsbad. 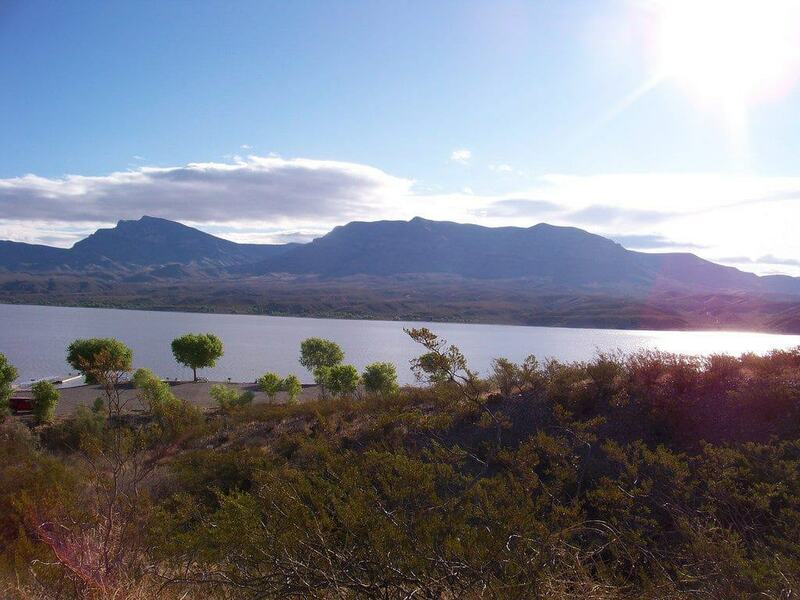 Brantley Lake is located in the Chihuahuan Desert, resulting in some spectacular scenery. The Brantley Lake State Park surrounds the lake offering camping and hiking to visitors. The lake itself is also a great place to go canoeing, kayaking and boating. Brantley Lake is stocked with largemouth bass, white bass, walleye, channel catfish and other species, making it popular amongst anglers. It also offers exceptional bird watching. Snow Lake lies completely within the Gila National Forest, which is located in the White Mountains. The lake is extremely scenic, sitting at an elevation of 2,229 metres above sea level. Ponderosa pines surround the lake, while a camping ground is on the west side of it. There are 40 developed sites, as well as a boat ramp for non-motorised boats. The best time to visit Snow Lake is from April to November. This is because of its surroundings as well as it being a great time to spot wildlife like elk, bear, deer and turkey. 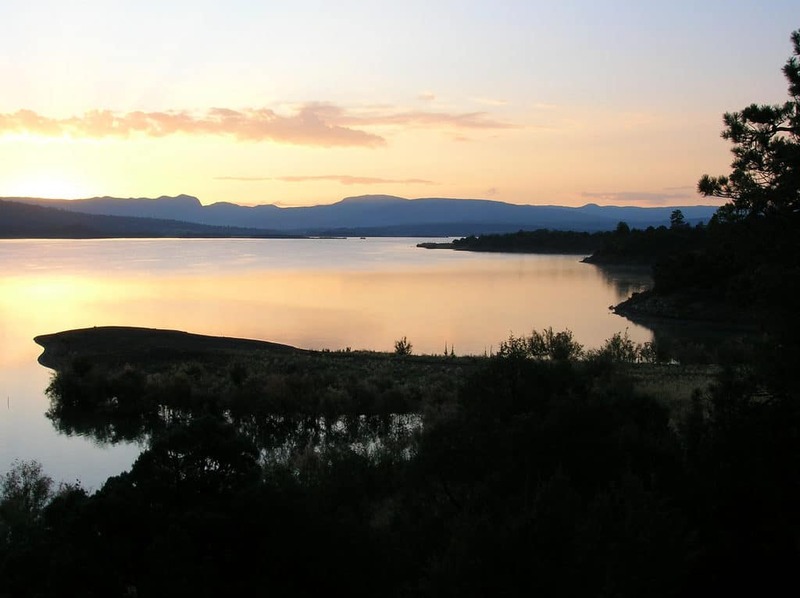 The largest of three lakes that sit within the Sugarite Canyon State Park, Lake Maloya sits along the New Mexico-Colorado border and is the main water source for the area. The artificial lake is also used for recreational activities. Kayaking, canoeing, boating and fishing are all offered here. There is one public boat ramp on the New Mexico side where visitors can access the lake. Lake Maloya has long been a favourite spot for birdwatchers. Ospreys, Canada geese, bald eagles, Western grebe, great horned owl and belted kingfisher are just some of the birds that can be seen around the lake. This 10 hectare lake sits in the Sangre de Cristo Mountains at an elevation of 2,397 metres above sea level. Morphy Lake is one of the smallest lakes in New Mexico, but also one of the most beautiful. The Morphy Lake State Park surrounds the lake, which is a good place to go fishing, camping and picnicking. No motorised boats are allowed on the lake, creating a tranquil atmosphere. The lake is quite hidden and not highly visited, making it a great place to get away from it all. It is open year-round, but does freeze over in the winter months. This alpine lake is located in the Sangre de Cristo Mountains at an elevation of over 3,300 metres above sea level. It is just below Wheeler Peak, which is the highest point in all of New Mexico! 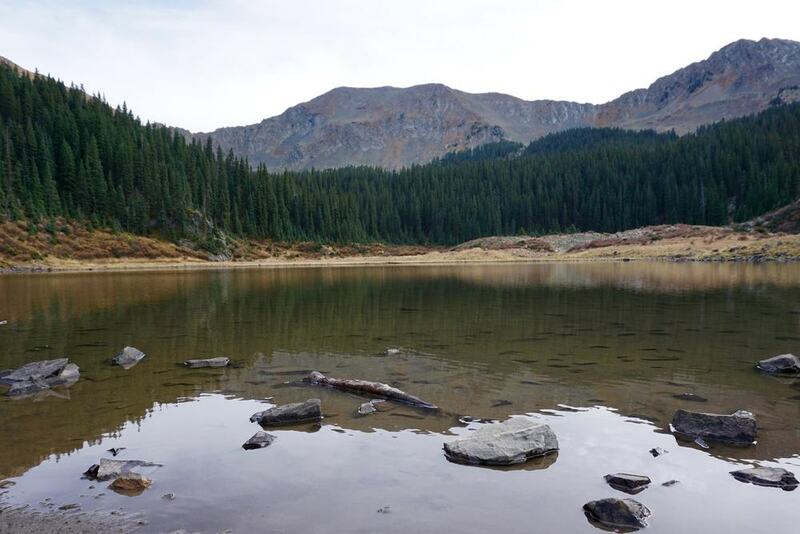 Williams Lake is only accessible on foot via the Williams Lake Trail from the Taos Ski Valley. This is one of the most popular trails in the area, as well as being one of the most scenic. There are signs along the trail, as well as some pretty magnificent scenery. There is also an inn along the way where people can stop for a beer, as well as a small waterfall. Todacheene Lake sits in the crater of the Narbona Pass volcano. It is a small lake, being just 1.6 hectare, which was created for recreational use. 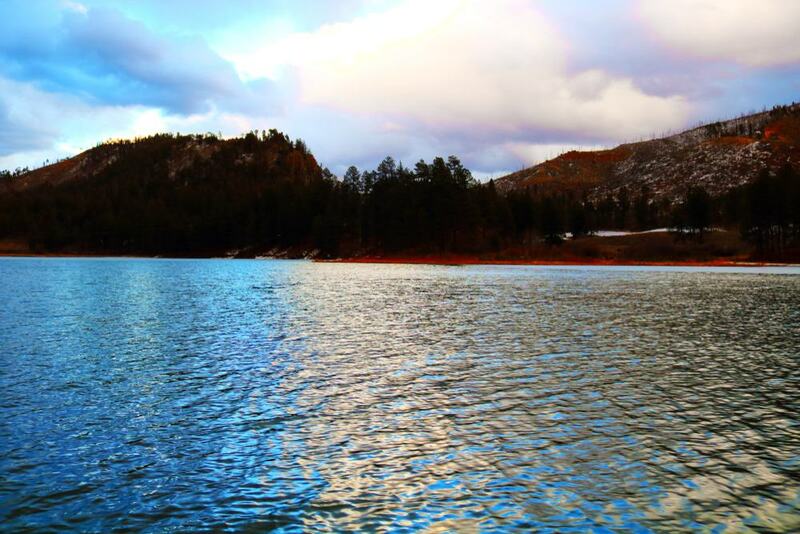 The lake is stocked with rainbow trout, attracting anglers from all over the world. It is also a great place to go hiking and cross-country skiing. The nearly one kilometre Todacheene Lake Trail encircles the lake and its surrounding area. It is open all year and is great for all skill levels, even children.